The only photoshoping of the images was to crop them. No retouching at all. The last few weeks have been good but this just tops it. I’m going to run for PM at the next election on the basis of this. I’m just so popular at the moment that I’ll at least give Brown a run for his money and Cameron will end up a definite number 3. I expect to be swept to power on a wave of love and adoration. I promise to be a force for good. A bringer of change. A new brush. I don’t hear any drums in my head. 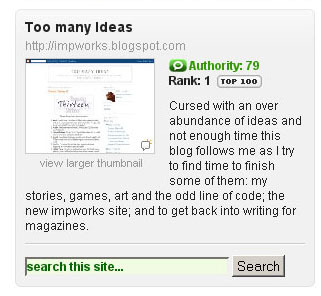 Right now I’m number 1 and it doesn’t bother me that anyone else with a blog listed on Technocrati is too. In fact I think their new approach of throwing out the judgemental system that ranks one blog over another is quite leveling. It frees us again. Right now we’re back to where we were in the heady days of ’96 (or maybe before then) when page rank ment nothing. SEO didn’t matter. What mattered was that we could post stuff on the web and other people could find it and enjoy it. 3 Responses to Technorati Rank #1! Are you absolutely *positive* about the drums?